Effects veterans Eventide aim to let singers in to the pedalboard party, with this cunningly designed effects-routing and switching box. 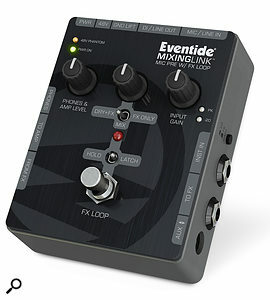 Eventide's Mixing Link is one of those products that seems so obvious that you wonder why nobody has done it before. At its simplest, it is a microphone preamp, complete with switchable phantom power, built into a stompbox along with a footswitch‑controlled effects loop for the connection of effects pedals or processors. This format makes it ideal for live performance, as vocalists can now create their own pedalboard of vocal effects in much the same way as guitarists do. The Mixing Link accepts microphone, instrument or line‑level inputs, and includes some additional I/O and routing options that extend its flexibility. For example, it can also be used to switch a guitar between two different amplifiers, using the effects send as the second output; or, conversely, by using the effects return jack as a second input, it could switch between two sound sources connected to one amplifier. It also works well as a stand‑alone mic preamp, offering up to 65dB of gain for feeding into the line‑level input of a recording system. The headphone output may be used for vocal monitoring, silent rehearsal or simply as a studio headphone amp. 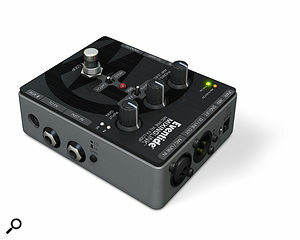 Built into a die‑cast box with an attractive top panel and powered either from a 9V battery or from the included universal‑voltage external adaptor — which is required if you need the phantom power — the Mixing Link uses a 'combi' XLR/jack for the mic/line input, with a separate jack for the instrument input. A three‑way toggle switch on the rear panel selects phantom power on or off, or battery operation. A small push switch selects between high and low input‑gain modes for the mic input: high would be the normal setting for dynamic microphone use, though loud vocalists working close to the mic might get by on the low gain setting. The two level‑setting LEDs will let you know which to use. There's also a ground‑lift switch, though this will probably only be needed if an input source that is already grounded (such as the preamp output of a guitar amp) is connected to the unit. Inside the case is another switch for setting whether the footswitch kills the connected effects dead or whether it allows any reverb/delay tails to continue to their natural conclusion. In other words, it kills either the effects return or the effects send. The Mixing Link uses jacks for the effects send and return points, which may be used either balanced or unbalanced. The main output is on a balanced XLR, and there's a recessed switch in the base of the pedal to select line or DI level. A further jack output is present, for sending the signal to an amplifier via the amp/phones level control (which also controls the level of the mini‑jack headphone out). Finally, there's a bi‑directional Aux I/O connection. This is a four‑conductor TRRS mini‑jack socket that can operate as either a consumer‑style stereo input or a mono output. By connecting the Aux jack to a device such as an iPhone or iPad running effects apps, it is possible to use your choice of apps rather than conventional pedals. The same jack could alternatively be used as a recording feed to a suitable device, and it is also possible to play stereo backing tracks into the aux input (which remain in stereo in the headphone output), where they will be mixed with the main input. Any signal present at the aux input is also fed, in mono, to the amp, effects‑send and main outputs, though there's no gain control for the aux input so levels must be controlled at source. All the circuitry has plenty of headroom, with the 500kΩ‑impedance instrument input able to accept signals up to +10dBu, and the line input up to +24dBu. The outputs can also manage up to +10dBu. A pair of semi‑recessed miniature toggle switches on the top panel allow the footswitch that controls the effects loop to be set to either latching or momentary action, and for the central control knob to adjust the level of only the effects, effects plus dry signal, or the wet/dry mix. The headphone monitor output and amp signals are controlled by the knob on the left, while the knob on the right sets the input gain. Status LEDs show that the pedal is powered up and that the phantom power is switched on. Clearly, a lot of thought has gone into making the Mixing Link as versatile as possible — the over‑used term 'Swiss Army Knife' is thoroughly deserved in this instance! It can be a DI box with ground lift, a signal source selector, an output switcher, a mic preamp, an interface for a smart‑phone recording system or the heart of a vocalist's live effects setup. It could also be used as a headphone amp, to allow a guitar player to switch an entire chain of effects pedals on and off from one switch, or to switch a signal between two different destinations. It can even be used to mix backing tracks with a vocal or instrument input. As a mic preamp, the Mixing Link has plenty of clean gain on tap for use with typical capacitor and dynamic mics. Even ribbon mics shouldn't be a problem, as in DI mode you can apply more gain at the input of the mixer or other device into which the Mixing Link is plugged, if the existing 65dB isn't enough. I couldn't really hear any significant subjective difference between the preamps in my audio interface (which is a good one) and the Mixing Link, so I'd have no qualms about using it for recording. However, the most valuable aspect of the Mixing Link, at least for my own applications, is the one first mentioned, namely its ability to connect to and control live vocal effects via its send/return loop. The mode I tried first was with the switch set to give 100 percent dry signal pass‑through, and the middle knob adjusting the level of added effect — which, for vocals, often comprises a combination of delay and/or reverb. The other modes are equally useful, letting you pass the whole signal through an effect such as compression or even distortion (in which case external pedals need to be set to 100 percent wet, of course). I experienced no noticeable added noise when connecting third‑party pedal‑style effects via the loop, and everything worked predictably and cleanly. Even using an iPhone to generate the effects worked fine, though you have to pick apps that can use the phone's existing I/O and not the ones that rely on specialist audio adaptors if you want to use the direct mini‑jack connection. Some apps also add a bit of latency, though if you're using them simply to add delay or reverb to your dry signal that shouldn't be a problem. The dry signal always remains pristine in this mode, as it never passes through the connected effects. Ultimately, the Mixing Link achieves everything it sets out to do with minimal fuss and with more than its share of style. Being picky, I'd say that some of the legending, especially that on the sides of the case, is difficult to read, but in all other respects the Mixing Link is a professionally designed piece of kit with a number of 'save the day' applications in addition to what I see as its primary function as a mic preamp with switchable effects loop. The only practical alternative I can think of that might offer similar functionality is to buy a small mixer. There are several affordable small‑mixer options, but nothing so compact as the Mixing Link, and of course mixers don't usually have built‑in footswitches to control the effects loop. Solidly built, with plenty of routing and switching flexibility. Clean audio path with good-quality mic preamp. Phantom power available when run from the included PSU. Plenty of problem‑solving applications both live and in the studio. Some legending is small with poor contrast. The facility to allow vocalists to connect and switch their own effects is exceptionally useful, but Eventide have taken this further by adding a number of features that make the Mixing Link a very flexible problem-solver.